Boudin Sourdough Bakery is a staple of Fisherman’s Wharf, one San Francisco’s many lovely tourism cesspools. Although you may be too cool to enjoy Fisherman’s Wharf, you may as well eat delicious food while being surrounded by tourists. It’s a simple concept of course. Fresh and delicious sourdough bread baked on site and transported around a busy restaurant by a series of moving ceiling trams and bread baskets on hooks… did I say simple? Although I’d never heard of Boudin, everyone else in line certainly had and were ferociously snatching up mugs, t shirts and other memorabilia from the gift shop. We ordered the signature Clam Chowder in a Sourdough Bread Bowl and a Classic Ham and Swiss on Sourdough. Both tasted fresh and accompanied the bizarre dining experience quite well. Tags: Bakery, Bread, Clam Chowder, San Francisco, Sourdough. oh, my favorite! 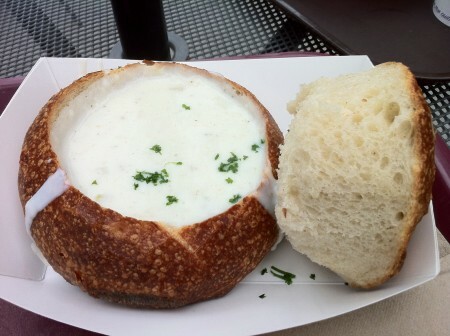 Clam Chowder in a Boudin Sourdough Bowl! !